But cancer is about more than just numbers and data. It's about people we love. Columbia's Velocity Ride is designed to fund breakthrough cancer treatments. Through Velocity we can fuel the end of cancer. The time is now. Columbia’s Herbert Irving Comprehensive Cancer Center (HICCC) is one of 47 National Cancer Institute (NCI) designated Comprehensive Cancer Centers nationwide, recognizing scientific and clinical excellence, and one of only two in New York City. With almost 4,000 new cancer cases seen each year, the HICCC delivers cutting-edge cancer research and patient care. The 259 scientists and doctors that comprise HICCC membership include 10 members of the prestigious National Academy of Science, six recipients of the NCI’s Outstanding Investigator Award, and winners of the Nobel, Lasker, and Pulitzer Prize. Our HICCC staff are dedicated to understanding the complex biology of cancer and to designing innovative cancer therapies and prevention strategies. The goal is to reduce the number of people diagnosed with cancer, slow its progression, and improve the quality of the lives of people with this disease. 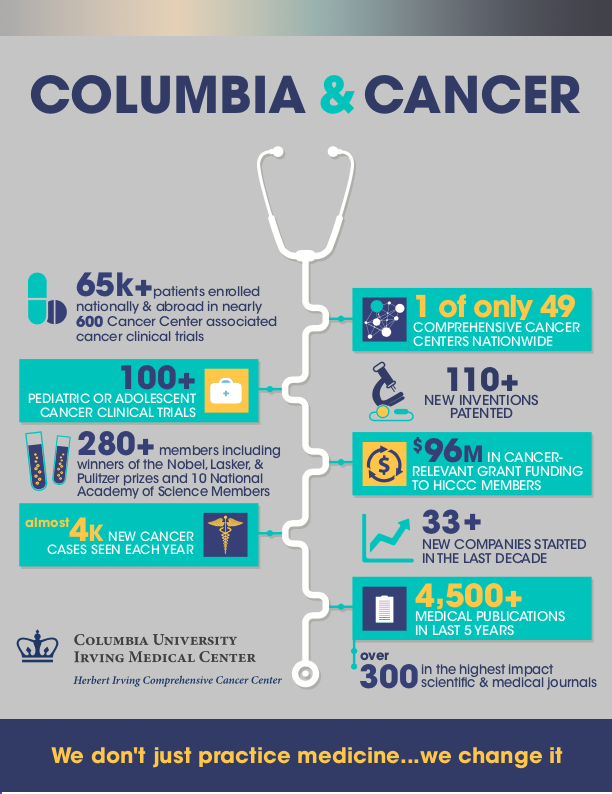 At Columbia, we don’t just practice medicine, we change it. HICCC researchers are at the forefront of pioneering the latest approaches to cancer treatment like immunotherapy and precision medicine. The unrestricted funds raised through Velocity will benefit our Center’s almost 650 clinical trials and studies, which include studies of 140 new cancer therapies that are developed to treat cancer and save more lives.